The New York Times, “Have We Lost Sight of the Promise of Public Education?” and my old writing…. AND, it made me realize that it’s time to bring out my piece years ago, “One Radical Idea to Fix Public Schools.” It appeared in many TABs in the Boston area and again in Education News in 2011. How so? First, the Times piece that has garnered much response, been picked up by Diane Ravitch’s Blog—and here! Check it out! It’s as timely as ever. Let me know what you think. Amazon now carries Special Education 2.0! I am thrilled to report that the book is now for sale. It was published yesterday and is already on Amazon. I just ordered my very own copy which should arrive by Saturday. 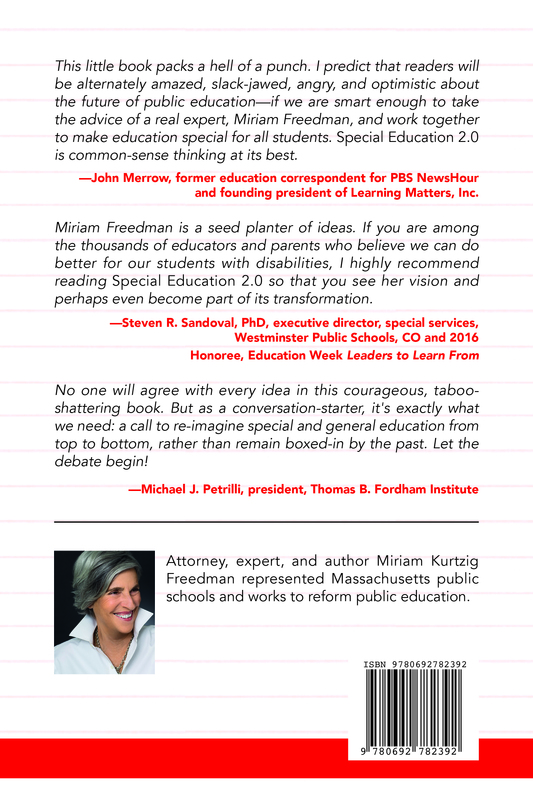 Please visit Amazon.com, buy the book, Special Education 2.0–Breaking Taboos to Build a NEW Education Law. If you like what you see, please write a review at Amazon. That will help us get on the path of systemic reform for all students. Sneak previews of the front and back covers. I’m very excited to let you know that…. my newest book, Special Education 2.0—Breaking Taboos to Build a NEW Education Law, will be published on February 22. Stay tuned for more information. The book will be available on Amazon (including Kindle), ed311.com, and on my website, schoollawpro.com. Thanks for your continuing interest and support for reforming education–especially special education. Here’s the book’s front cover! Just in time! Now that special education and the IDEA on the front pages, here’s my new book! Timing is everything! 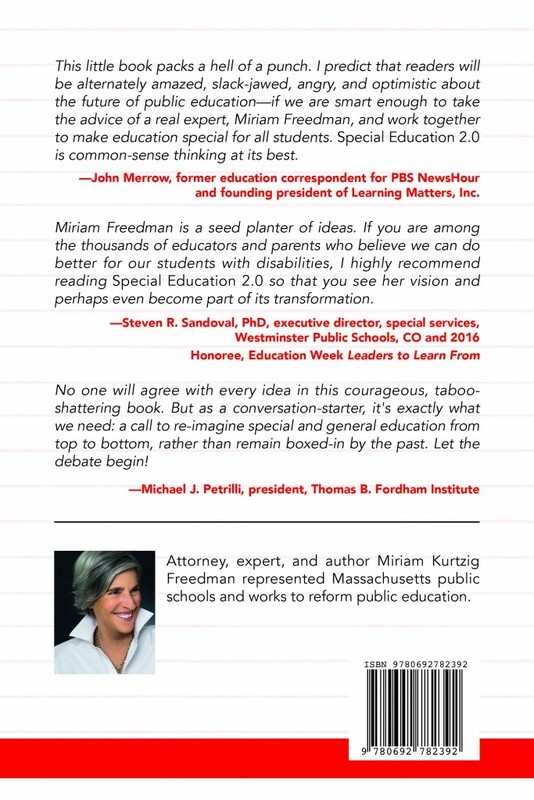 Now, it’s time for my book — a call for a national conversation for a major fix of our broken special education system! My new book, Special Education 2.0–Breaking Taboos to Build a NEW Education Law will be published on February 22, 2017. I read with great interest (and some concern) the February 4, 2017 The New York Times op-ed by Maggie Hassan, a Democratic senator from New Hampshire, explaining why she won’t vote for Betsy DeVos. The op-ed starts off well, echoing deep beliefs I share—that public schools are vital for our nation; a necessary foundation for our democracy; a reverence for schools should be held by public officials. Focusing on these key basics may raise valid issues about this nominee, who has championed parental choice, often through charters and vouchers, though I haven’t analyzed her beyond the fury coming at her, much from teachers unions, and don’t comment here on that. About charters and vouchers—they are not the answer because they can’t be scaled fast enough–ever. After almost a quarter of a century in our country (since the early 1990’s), charter schools educate about 3% of US students. A drop in the bucket. In comparison, special ed educates 13-14% of students. If, as some critics charge, the push for vouchers is simply to enrich private companies, that’s way too cynical for me and I don’t deal with that here. As someone devoted to public education and working to reform it, I find this use of little words “all” or “every” troubling. For me, “all” students means focusing on all students–from the most gifted to the most needy and all in between. That’s what public schools are supposed to be about and that’s why many need to be better than they are. Instead, here the words “all” or “every” seem to mean that all students with disabilities have the same access to education as all others do. While not questioning that, I am troubled by the focus.When I read about people wanting public schools to work well and focusing on how well they work for students with disabilities–I am glad for them, of course–but it seems that the tail is wagging the dog. The focus on special education students leads us astray and may even inadvertently bolster the push for parental choice, vouchers and charters–for people to leave public schools that are NOT focusing on all students. It’s a vicious circle. Schools should serve all students with commitment, funds, time, and passion. A vote for a Secretary of Education should be a vote for all students, as I use that term. HMMM. This might be interesting. Maybe you wondered about this, as did I. As you know, President Trump has nominated Judge Neil Gorsuch for the Supreme Court. The nomination fight begins. But this post is not about that. Meanwhile, back at the special education desk, we have an important case before the Supremes right now—Endrew F. v. Douglas County School District. Oral arguments were heard before eight Justices in early January. The question they will (presumably) resolve is: What level of benefit does a school needs to provide to a student with disabilities in order to meet the FAPE (free appropriate public education) standard in the law? Or, in legal parlance, will the 1982 Rowley decision be affected, changed, amended, overruled, remain the same? Without getting into the weeds about Endrew F., here’s the geography quandary. Did this puzzle you also? Judge Gorsuch is currently on the 10th Circuit Court of Appeals, in Denver, Colorado. The three-judge panel decision by that Court in Endrew F was appealed to the Supreme Court and currently before it. Judge Gorsuch was not part of the three-judge panel that heard the case at the 10th Circuit. What will the Supremes do? Will this nomination have an effect on current cases before the Court, such as Endrew F. Will the Supreme Court continue toward a decision with the eight Justices who heard oral argument in early January? Will the case be withdrawn? Will the Supreme Court rehear the case so a 9th Justice (Gorsuch or another) can hear it and be part of a decision? What will happen? Stay tuned. Don’t we live in interesting times?